Tinytag Re-Ed count data loggers are connected to a tipping bucket rain gauge specially adapted to monitor overland surface run-off. The Moors for the Future Partnership (MFFP) conservation organisation is part of the Peak District National Park Authority. The MFFP specialises in restoring upland blanket bog habitats by stabilising and re-vegetating bare eroding peat patches and also diversifying areas that have become dominated by single species such as heather or grasses. The aim is to help the blanket bogs of the Peak District and the South Pennines become naturally sustainable systems that absorb carbon, reduce flood risk and deliver clean water. Robust Tinytag Plus Re-Ed TGPR-1201 count data loggers are connected to tipping bucket rain gauges that have been adapted to accept rain water flow travelling over the surface of experimental plots, into a sunken gutter and then through a pipe and into the rain gauge. This is part of a wider project investigating the hydrological response of a peatland mini catchment to restoration. Restoration will involve gully blocking and planting Sphagnum moss plugs and measuring the effect on storm run-off, in terms of peak flow amount and peak timing. The number of tips in each 5 minute period is logged and the data downloaded every three weeks, using a field computer. A comparison is made between the annual number of tips between a control area and a treatment area, both before the treatment with the Sphagnum plants, and for many years after. Michael Pilkington is Senior Research and Monitoring Officer at MFFP, and chose Tinytags for a number of reasons - their robust design, reliability, ease of use, good value for money, and long battery life. He concludes, "The Re-Ed data loggers are helping us to build a picture of overland flow in remote and exposed upland environments where access is difficult and dependable equipment is vital." Cathy Clark of Gemini Data Loggers concurs: "The robust design and long battery life of the Re-Ed loggers is ideal for harsh and remote environments such as this. Connection to a tipping bucket rain gauge is a typical application for these count loggers and we are delighted that they have proved so useful in this Project." Tinytag Re-Ed loggers are designed to work flexibly with a range of third party sensors. The latest range of Tinytag Instrumentation data loggers has now replaced the Re-ed units, providing voltage, current and count loggers for use with third party sensors in order to provide accurate and robust data loggers for specialist applications such as this. 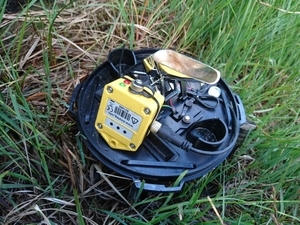 The image is of a tipping bucket rain gauge with its lid removed, showing the logger inside.